Huff Post: How Paul Ryan Will Pick the Next President﻿. Over the weekend, the Huffington Post ran an article: How Paul Ryan Will Pick the Next President. Writers Chris LaTondresse and Adam Phillips claim credit for conceiving a scenario that would place an establishment Republican into the White House even if Trump is the GOP nominee. Sorry guys, you’re a bout a month late. The GOP can still get a “true” Republican elected … here’s how. Since it’s timely (and getting jacked without attribution), I thought I’d reprise it today. (1) Trump hijacks the GOP and wins the nomination … much to the dismay of the GOP “establishment”. (2) Trump and Hillary fight a tightly contested toss-up race. So, how can the establishment get a “true” – or at least “truer” Republican elected. It wouldn’t be easy, but it’s possible. Let’s connect a couple of dots. Dot #1: Politico is reporting that some big GOP donors are researching ballot-access requirements for independent candidates in case Trump wraps up the GOP nomination. Dot #2: The electoral map and the quirks of the electoral college process. There’s an out-of-the box way to make a “true” Republican president … really. Imagine that the GOP establishment bolts the RNC and puts together a program laser-aimed at 3 states: Texas, Ohio and Florida. The goal isn’t to win 270 or more electoral votes …. the goal is to win at least 2 of Texas, Ohio and Florida. How to do it …. First, pick a ticket with specific appeal to those 3 states …. say, Perry or Cruz (for Texas), Kasich (for Ohio), and maybe Marco or Jeb (for Florida). Let’s assume that it’s a Cruz – Kasich ticket. Second, don’t even try to compete in states other than Texas, Ohio and Florida. I mean laser focus. Hit those states with state-specific candidates, unbeatable GOTV infrastructures, and shock & awe levels of ads. Third, “encourage” the RNC to direct all of its support to Congressional and Senate contests — more the former than the latter. 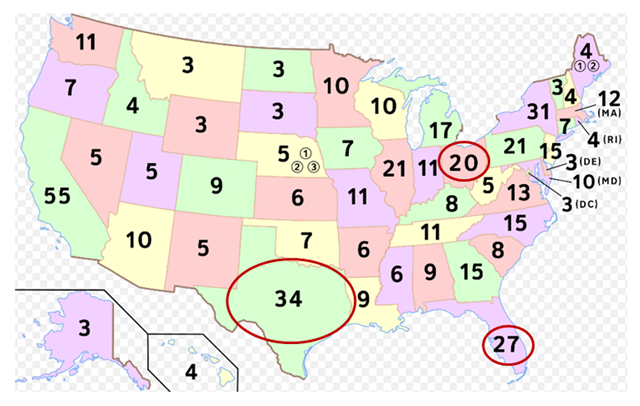 Let’s pretend that a Cruz-Kasich ticket wins Texas and Ohio … 54 electoral votes. That may be enough to deprive either Trump or Hillary of the magic 270 electoral votes required to win the prize. For argument, say they split the electoral votes for states other than Texas & Ohio … each would be at 242 electoral votes … not enough for an outright win. In that case, what happens? The election gets thrown into the GOP-controlled House of Representatives with each state delegation getting 1 vote. (Currently, the GOP controls 33 states). There’s no law or rule – written or non-written – that they have to vote for the candidate who amassed the biggest popular vote count or the most electoral votes. The Senate would elect the Vice President from the 2 Vice Presidential candidates with the most electoral votes, with each Senator casting one vote for Vice President. Note that the candidate set is the top 3 electoral vote-getters. The 3rd place finisher doesn’t have to be close to the top 2 … he just has to be third. So, the House could vote the Presidency to, say, Cruz … as long as he wins some electoral votes … just so he spoils Trump and Hillary from getting to 270. Conceivably, the scheme would work by just taking Texas … but that doesn’t leave much margin for error. Obviously, the candidate doesn’t have to be Cruz. It could be Perry or Jeb or anybody who could carry Texas. Would there be political chaos? Of course there would be. But, in the year of Trump and Sanders, don’t rule anything out. This entry was posted on March 21, 2016 at 6:59 am and is filed under 2016 Presidential Election, Trump, Donald. You can follow any responses to this entry through the RSS 2.0 feed. You can leave a response, or trackback from your own site.